Isla Guadalupe in Mexico have become one of the great destinations for eco-tourists. They don't come to see the island, they come to see what lives in the sea. Isla Guadalupe is one of the few places on Earth where one can catch a glimpse of nature's most perfect predator, the Great White Shark. 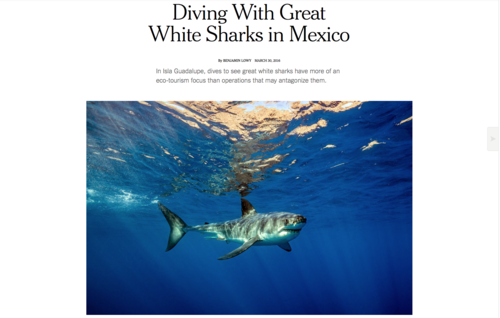 Sony Artisan Ben Lowy went to Isla Guadalupe on assignment for the New York Times to photograph the Great White and he did it with Sony cameras in a Nauticam underwater housing.